INFJs have a reputation for being mysterious creatures. If you’re trying to figure out what an INFJ is really thinking, that reputation is somewhat justified. And judging by the number of people online asking, “How can I tell if an INFJ likes me?” it can be very difficult to figure out if an INFJ is attracted to you, especially in a romantic sense. Even though the whole “otherworldly INFJ” thing has been blown way out of proportion in internet descriptions of the type, there are some things about INFJs that just don’t make sense to most other people. Since INFJs are the rarest type, our minds are wired to think in a fundamentally different (not better) way than the majority of the world’s population. As a type which uses Extroverted Feeling to make decisions, INFJs are very interested in maintaining harmony in the outer world. This tends to make them very agreeable people. In groups, we can be friendly and sociable with just about everyone. However, we’re also introverts who spend a lot of time inside our own minds. We’re often reserved, private individuals, leaving many people confused about how we actually feel. In addition, many (though not all) INFJs struggle with varying levels of social anxiety and shyness which makes it even harder for us to make it clear when we like someone. INFJs long for relationships. Whether it’s close friendships or romantic partnerships, we’re hard-wired for connection (as are all people, really, though we approach it in different ways depending on personality type and individual differences). As I think most people know, finding a good relationship is bloody difficult (side note: I may or may not watch too much British television). Today, though, we’re not going to talk about the relationship problems that everyone faces. We’re focusing on the problems that many INFJs find particularly troublesome. Other types (especially NFs and FJs) will probably identify with these struggles as well, and I’m sure INFJs also struggle with some relationships problems that aren’t on this list. Still, these five things seem to come up with more consistency for INFJs. It’s nearly impossible to study Myers-Briggs types on the Internet without coming across several articles about the incredibly rare and nearly magical INFJ type. They’re described as the world’s prophets and shamans with deep spiritual insights. They’re called natural empaths with unfailingly accurate telepathy. They appear so deep you’ll never plumb the depths of their souls. They’re seen as the ideal type — the one everyone mis-types as because they wish they were this special. If you’re vomiting a little in your mouth after reading that description (or laughing out loud at the crazy claims in the image up there), you’re not alone. The tendency to portray INFJs as something akin to a demigod or goddess doesn’t sit well with most healthy INFJs. Aspects of it even scare me. And yet it’s still around. On the one hand, you have certain INFJs (and wanna-be INFJs) embracing the label and using it to look down on other types. That’s not the purpose of personality types and it’s damaging to us as well as to others. 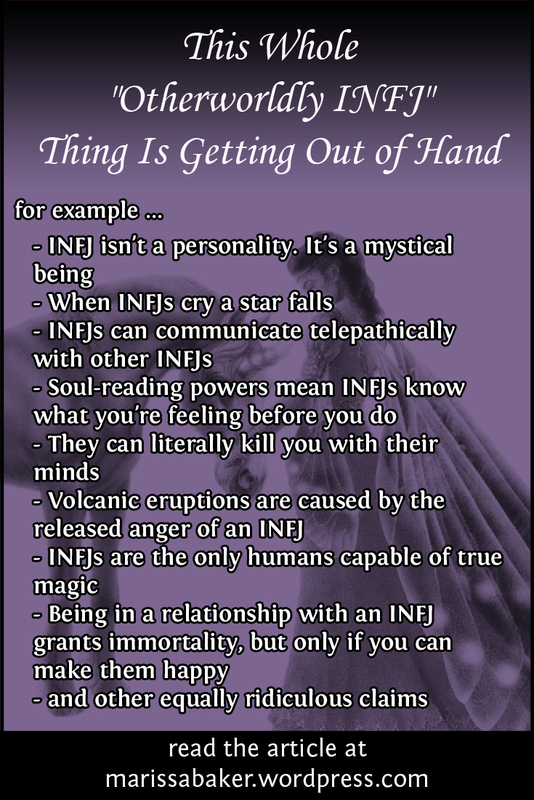 And on the other hand, you have people buying-in to the otherworldly INFJ stereotype and reacting in ways that aren’t good for the INFJs. Some even “hunt” INFJs for a relationship, which is pretty creepy. Think INFJs are hard to figure out? Have you found yourself puzzled by an INFJ’s contradictory words and behavior? Well there’s no need to worry any more. 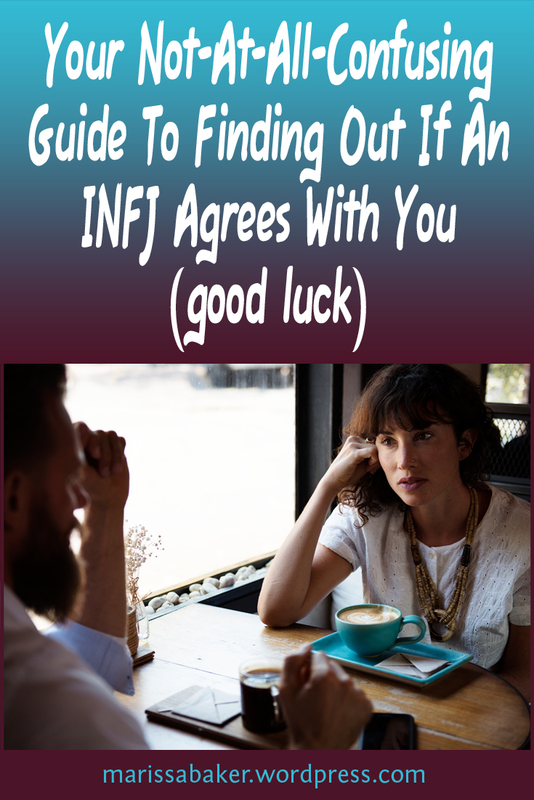 I’ve got your quick, easy, and not-at-all-confusing guide to finding out if an INFJ agrees with you. No more will those mysterious unicorns of the personality type world confuse you in conversation. No longer will their confrontation-avoidance leave you wondering whether an INFJ actually agrees with what you’re saying or is simply making you think they do so you won’t get upset with them. Nodding mostly means we’re listening to you, so this could really go either way. Cross-check with other signs. Making eye contact typically means the INFJ agrees with you. Not making eye contact could mean one of three things: they disagree with you, they don’t care, or they agree with you but don’t want to admit it. 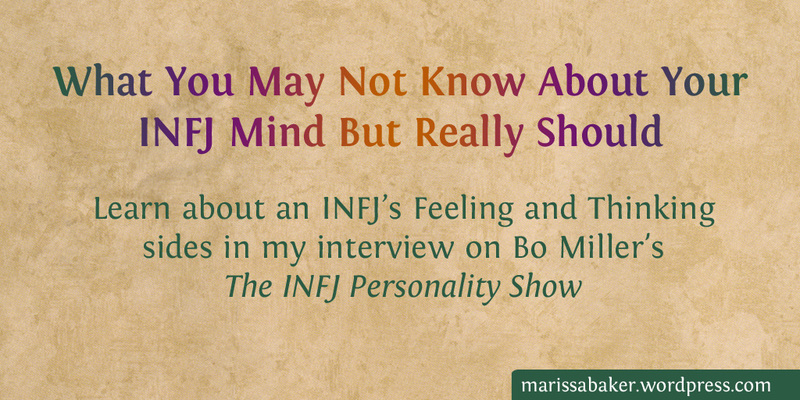 A few weeks ago a fellow INFJ named Bo Miller contacted me and asked if he could interview me on his new podcast. After picking my jaw up off the floor and texting my boyfriend to share that I was equal parts terrified and excited, Bo and I started a conversation that led to this interview. Our conversation focused on how INFJs can understand and learn to use their Extroverted Feeling and Introverted Thinking functions. 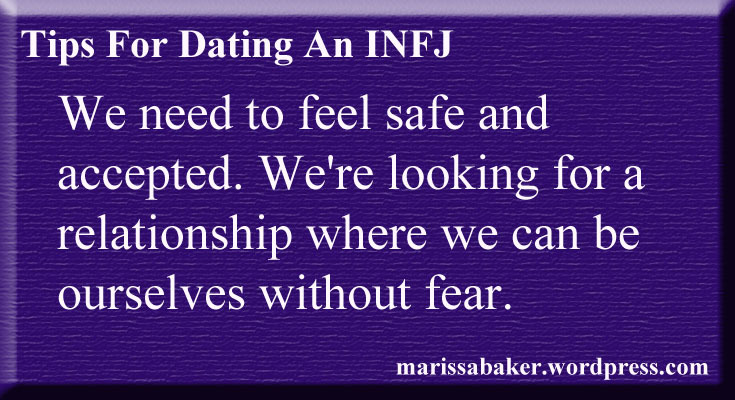 So you want to date an INFJ. I’m not quite sure whether to congratulate you or pat you consolingly on the shoulder. Perhaps both. 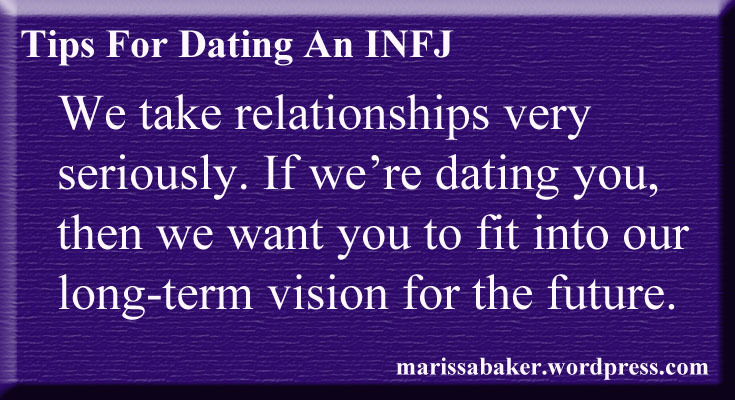 Assuming you want this relationship to go well, one of the most important things you can do is try to understand your INFJ love-interest. We’re the rarest personality type and we often feel misunderstood and alone. Showing us that’s not going to happen with you will instantly endear you to an INFJ’s heart. 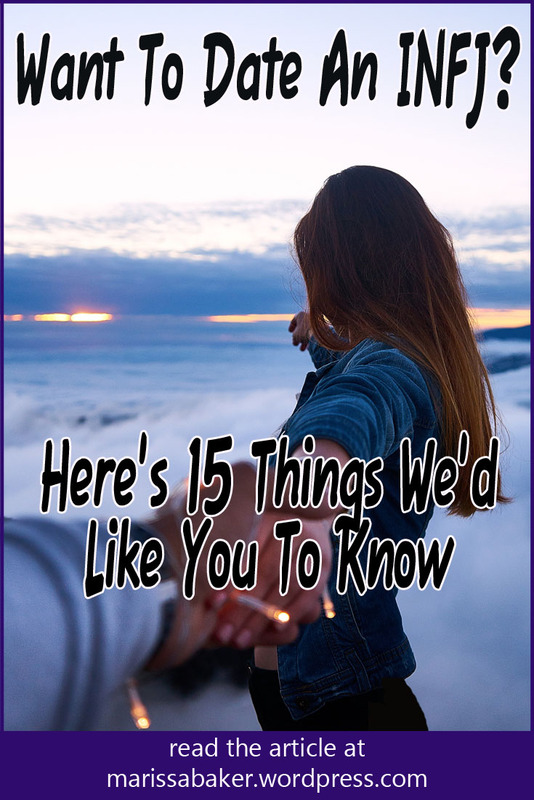 And so here you are learning about the 15 things INFJs really want you to know as you begin a relationship with us. They might not all be equally true of every INFJ, but this list is the result of feedback from and discussion with nearly 20 different INFJs so you’re getting a pretty good idea of what we’d like to say to you. Even though I’m an INFJ myself and I’ve written a fairly successful book about the INFJ personality type, I still like to get feedback from other INFJs before writing a post like this. And so I want to say a big “Thank you” to everyone in the Facebook group INFJs Are Awesome who responded to my question about what they thought people should know before dating an INFJ. You guys helped make this post so much better than if it were just me typing away my thoughts in a vacuum. While there are some INFJs who will have one-night-stands or enter casual relationships, most of us are interested in something long-term. If you’re not willing to take the relationships seriously we need to know that up-front so we can make a decision about whether or not to bother with you. Most of us know how to be alone and we’d rather stay single than settle for a relationship that just adds stress and anxiety to our lives. We also have a vision for how we want our lives to go and we’ll be going into a relationship trying to figure out how you might fit in with that vision.